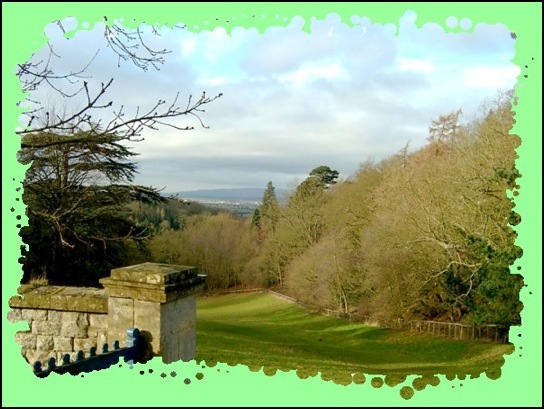 Upper Quinton, Mickelton and Ilmington, which were visited on this walk, are some of the northern most communities of the Cotswold Hills and being within 45 minutes from Warwick, or 30 minutes when Mick’s driving, are regularly visited by all of us. Click map to see our route, other routes referred to and legend. We arrived at Upper Quinton shortly before 8.45 a.m. 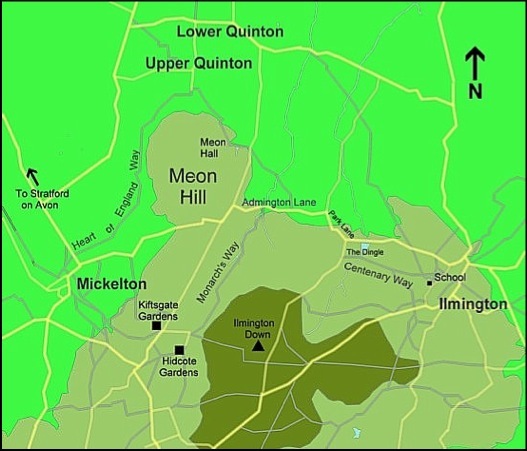 Although this walk could equally be tackled from Mickelton or Ilmington, Upper Quinton is the best place to start should you wish to shorten the walk because of inclement weather or aging legs. Larry and Mick, as ever, were concerned about my welfare!! By 9 o’clock we were “booted” and were soon on the Heart of England Way heading south towards Mickelton. The first half of this route to Mickelton followed the lower contours of Meon Hill, whose claim to fame was the unsolved murder on the hill on St Valentines Day in 1945 - the only thing we intended to murder today was a pint of beer at the end of the walk. However, all of us would have liked to have gone onto the top of the hill but unfortunately there are no rights of way, although Larry did tell that some years ago the hill was used for motor cycle scrambling and he had been on top of it to see one of these events. Leaving the grassy contours of the hill our route went over ploughed fields and, following the recent rain, the soil was very heavy which not only made walking more difficult but as Mick remarked it even made him look taller. Just before reaching the Stratford to Mickelton Road, the Heart of England Way passes by a collection of market garden buildings that have been derelict for many years. The sites probably waiting for planning permission. 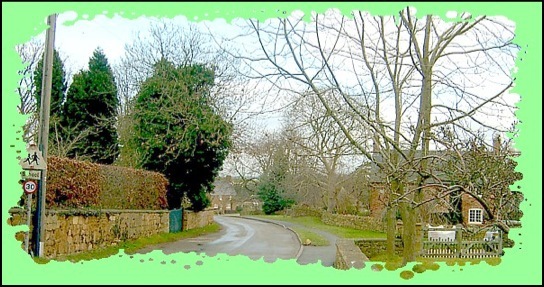 Although we could have turned left and followed the road into Mickelton we took the path on the other side of the road – still the Heart of England Way – and entered the village through a Children’s Play Area, which was quite empty, which was surprising as it was schools’ half term week. Leaving the playground we turned right and followed the road through the village until reaching the turning on the left which leads to the local church. 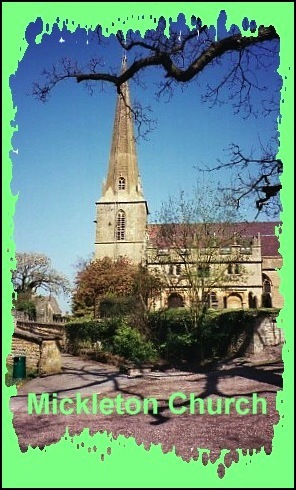 Soon after, having passed the church, we began steepest climb of the day. I don’t think I’m getting any fitter as I get older but today the climb didn’t seem as bad as I remember it to be when I'd walked up it on previous occasions. Maybe the company was taking my mind off it, although on the last stretch to meet up with the road outside Kiftsgate Court Gardens, Mick and Larry left me behind but it was probably because I had stopped to take some photographs. At the top of the hill more photographs were taken before we continued east along the road to Hidcote Manor, also noted for its garden. However, today it was closed but the picnic area adjacent to the car park, with picnic benches, was not, so we “used the facilities” and had a leisurely “elevenses”. At this point, having continued east through the Car Park we could have turned left (north) onto the Monarch’s Way and followed it the 1 ¼ miles downhill to meet up with Admington Lane, and then followed it right to meet up with the actual route we took. A few years ago I walked this route with Anne. On that occasion we walked around Meon Hill clockwise and on a very hot summers day coming uphill on the Monarch’s Way was hard work, but very pleasant. However, today we went east and with the exception of a dogleg in the path it was a straight forward route to the single track roadway that passes by the wireless station and the trig point on top of Ilmington Down, the highest point in Warwickshire. 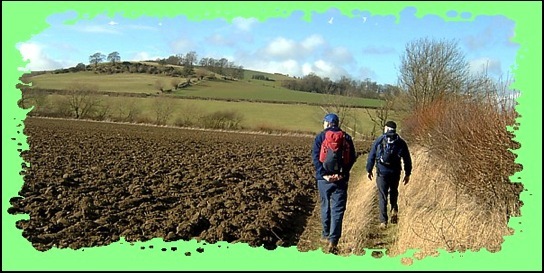 Although to reduce the distance walked we could have gone left (northwards) all the way down this tarmac track, both Mick and Larry seemed to feel I needed considerable exercise so, after walking about 3/4 of a mile down this track, we turned right and headed for Ilmington. This path, which we had all done before from the opposite direction, was well marked as it went downhill into a dip. A very muddy dip, which we navigated very carefully for fear of slipping and, at the same time, discussed the various techniques for dealing with such hazards. Mick told us that he had tried the “run down hill through the mud” technique when he was once walking in the Cotswolds. Larry and I were less than favourably impressed with this approach as it transpired that on his way down through the mud one of Mick’s feet slipped and what followed must have been truly interesting to watch. From the description it seemed that Mick did a very poor impression, of a triple lutz, or some similar ice skating move, before finishing at the bottom of the incline sitting in the mud with a veneer of mud covering most of his clothing. We were so interested in this that we missed a sign and went too far right when we should have gone left; but this was soon rectified and proved to be the only significant navigational error of the walk. At this point we also felt a few drops of rain, the only time on the walk when it looked as if the weather might turn nasty, but they were soon gone. 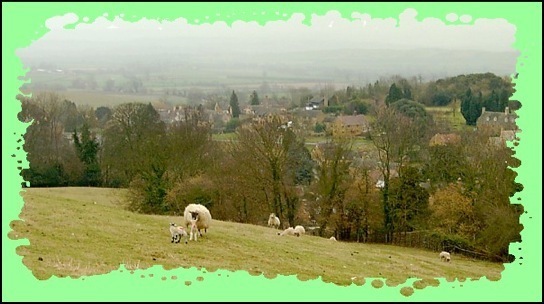 So it was left, uphill out of the dip and now with paths ahead very obvious we made good time over the mile or so to Ilmington enjoying views of newly born lambs with the village below them as a backdrop. Once we had reached the village we had a short amount of road walking. We passed the village church on our right and having passed the local primary school we immediately took the footpath on the left that went along the side and rear of the school’s grounds. We then met up with the Centenary Way which we would follow back to Upper Quinton. Here we turned right and followed the track downhill to the T junction with Park Lane, and ensuring we were facing the oncoming traffic walked left along road, ignoring the junction right, until, just past a farm, we met up with the Monarch Way and followed it right, into a field. Now it was over fields with the route initially going north until it veered north-west to meet up with the road between Lower Quinton and Hidcote, just outside Meon Hall. Our route initially went up the drive to the Hall but, before reaching it, we followed the way marks that took us across a newly ploughed field but fortunately it was much drier than the ploughed fielded experiences earlier in the day. This last mile or so back to the car was really pleasant with views of Lower Quinton and its church to the north and the wooded slopes of Meon Hill to the south. And suddenly we turned left down an alleyway between houses and were back at Mick’s car. So without further ado it was muddy boots off, shoes on and off to Ilmington and the Red Lion Pub for a pint. This walk, according to Mick, is about 9.5 miles in length - although Larry reckons it was probably a mile longer. However, it can be made shorter by about 2.5 miles by taking the Monarch’s Way from Hidcote, or reduced by about 2 miles by ignoring the detour into Ilmington. But whichever way you go, it’s a good walk. As both Larry and I had left our Ordnance Survey 1:25,000 scale Explorer Map for the area (No. 205 Stratford-upon-Avon & Evesham) at home, we made do with an extract from an OS 1:50,000 of the area – which probably also helps explain our momentary navigational error.